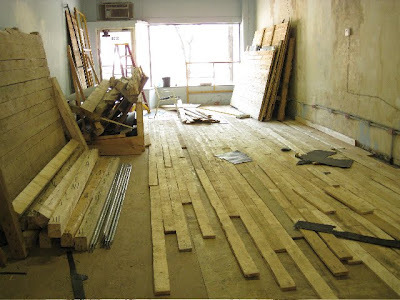 Charles Clay is the owner and proprietor of Alton Park Recycle, a program in the Alton Park neighborhood that creates new pallets from old pallets, along with other scrap lumber. Through this process, he is providing skill-based jobs to Alton Park residents who may not otherwise be able to find viable avenues for work. Charles has been to two consecutive pallet pick-ups. During our talks, it's become clear that the full impact of his good work is hard to encapsulate in a few photographs and a paragraph. So we've made this little video. Enjoy. Local Spotlight Series: Alton Park Recycle from CreateHere on Vimeo. "I needed to enclose my outbuilding garage to put my woodshop and garden shed in. I bought some 2x4s and 2 pieces of OSB for the project, but it was about 90% recycled and free material. Even the nails for the project were free as I had lent out my framing nailer in exchange for the box of pneumatic nails he bought. 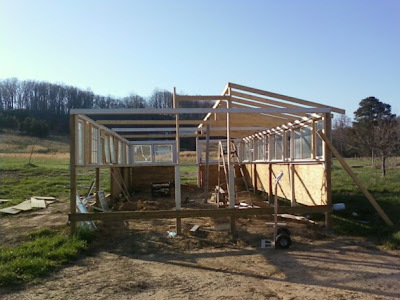 I did a 6 ft. sliding door on one side of the garage so I could get my lawnmower in and out easily." Dan Bethune is a UTC Art professor who primarily teaches 3D arts. This spring, Bethune's Sulpture 2 class participated in a gallery show entitled "Grey Matter" at the Mountain Arts Community Center on Signal Mountain. 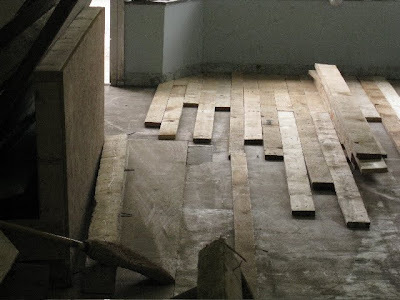 For the show, each student built a room to house an autobiographical installation piece. Bethune brought a few students, including sculpture major Aaron Cowan, to both the first and second Pallet Project distributions to gather wood necessary to create each autobiographical space. "I still play in the sand and create chair-and-blanket forts, only now I take the sand out of the box and I build the room to house the fort. So try to forget about the mortgage and your cell phone bill and try to remember what it was like to be worry free...Have fun." Other artists in the "Grey Matter" exhibit were Monica Taylor, Jackie Weathers, Mark Walter, Sally Coe, and Sarah Beeman. 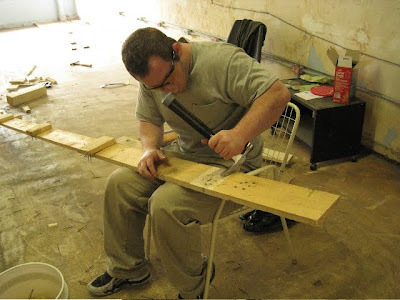 Andrew Nigh is a local artist whose medium of choice is wood. From fine furniture to abstract sculpture, he can make something beautiful with just about any pile of scrap wood. His fire sculpture called "The Integraton," built from Pallet Project wood and burned as part of a 4-Bridges after-party at his Main St. studio, is a perfect example of that fact. 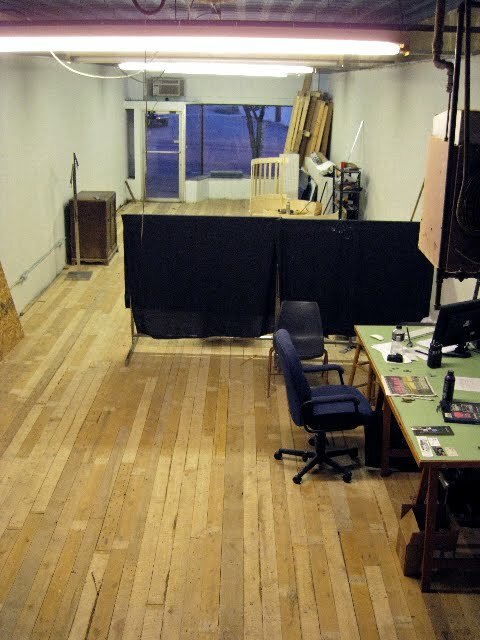 Says Andrew: "Believe it or not that whole thing was made with one sheet of the crate plywood, and four 2X4's!" 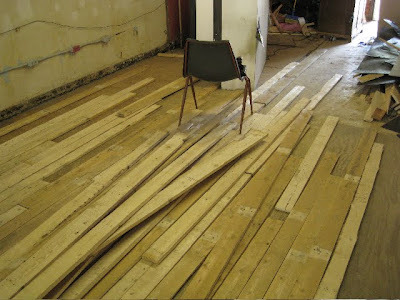 In addition to artwork, Nigh has used his share of pallet wood to create jigs, work tables, and some scale-models of larger installations to be burned. To see a full gallery of Nigh's work, visit wintersunstudio.com. 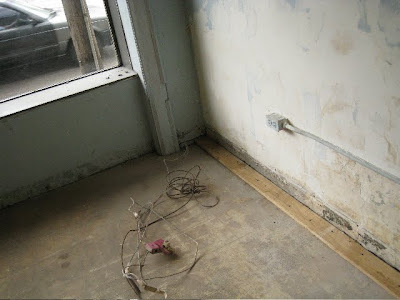 "In March 2010, I decided to rent a commercial space on Brainerd Rd. The only reason I imagined it was possible was because of the Pallet Project. The rough cut timbers were exactly what I needed, and when they were finally down they looked exactly as I imagined they would... Thank you, VW." At the second pick-up, Michael and what looked like his entire family spent the day with handsaws and hammers, filling a Uhaul truck to the brim with pallet wood. 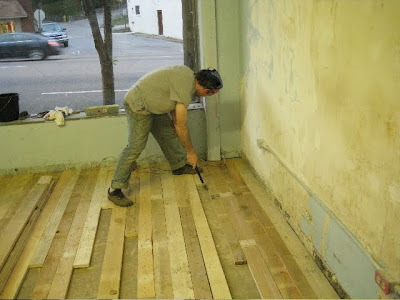 A few months later, he has floored his entire space and is starting to build furniture with the wood he took home. 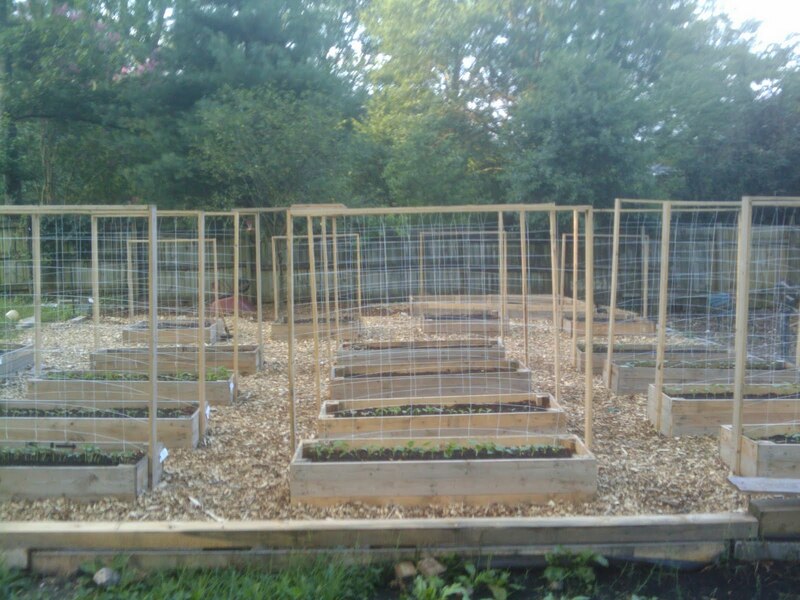 Jennifer and her husband built these zen-like raised garden beds for their beans, squash, zuchini, pumpkin, etc. 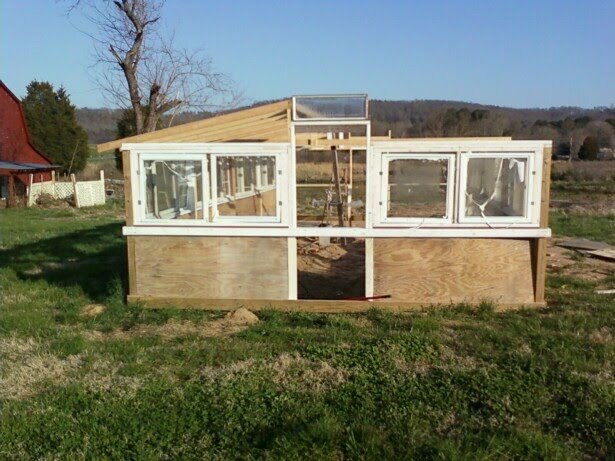 Since most of the veggies they wanted to grow were vining or grew up in the air like tomatoes or green peppers, they made these gorgeous little narrow vertical beds instead of the traditionally wider ones. 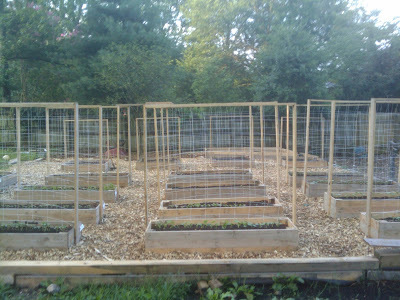 Says Jennifer, "on our budget we'd never have been able to build our vegetable garden beds, thanks so much VW!" I met Paul and Stephanie Baudino at the second pallet pick-up. They were total sweethearts who spent all day cheerfully picking apart pallets, while taking breaks to help those around them or chat with me by the water cooler. After the third pick-up, Paul emailed me these images of a partially completed greenhouse. 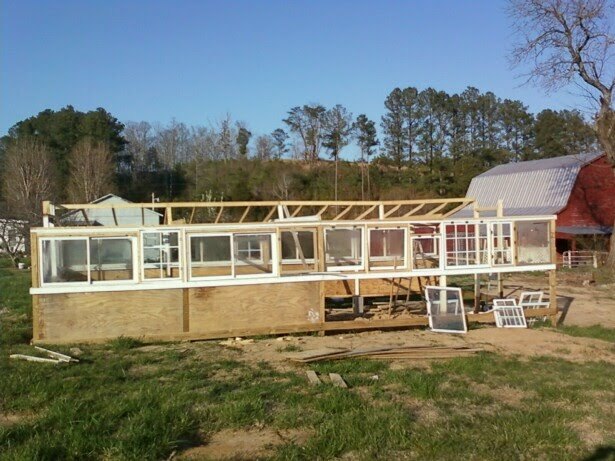 Well over half of this structure is made from repurposed materials, from old window panes to Volkswagen pallet wood.